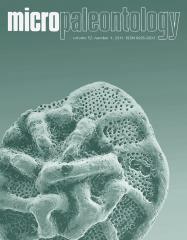 ABSTRACT: The study of the foraminifera and ostracodes from theUmmer Radhuma Formation in five wells of the Dukhan Oil Field in Western Qatar allows to reevalute the age of the type-levels of the larger rotaliid foraminifera first described by Smout in his classical paper in 1954 as Early Eocene (late Ypresian, zones P8/9 respectively E6/7 of Berggren and Pearson 2006a). During the Early Eocene, a rather uniform depositional environment prevailed in a large part of the Arabian Platform as indicated by the close similarity of the microfaunas of Western Qatar to those of the same age in the Rub alKhali in Saudi Arabia (Hasson 1985), Wadi Rusayl inOman, (Racey 1995), Shabwa in southwestern Yemen (Ismail and Boukhary 2008) and this fauna extends eastwards to Tibet (Wan 1991). The environment of deposition ofUmmer Radhumawas marine andmost probably sheltered lagoon that prevailed during the Ypresian of Qatar. The planktonic and the larger rotaloid foraminifera and the ostracodes are illustrated and discussed briefly.